Nico Hulkenberg: "It’s been quite a difficult weekend for the team, but I have to give credit to the way they have handled the situation and fixed it. The main penalty of yesterday was losing the track time and maybe with more set-up time we would have been able to make it through to Q3 today. The other key factor in the qualifying session was the red flag, which caught me out because I was on my first quick lap and had to abort it. So I only had one lap to get the job done and I just missed out by two hundredths of a second. Despite the limited track time, I feel quite happy and confident in the car, and I think we can perform well tomorrow. Points are still an achievable target." Sergio Perez: "It hasn't been the easiest of weekends so far. I was very optimistic on Friday, before the accident, but what happened has affected us quite a lot. We have lost some of the new upgrades that we had brought to the race – parts that were working really well and were making a big difference. When we got back out on track this morning, I wasn’t particularly happy with the aero balance of the car, which has been quite unpredictable. Hopefully looking at the data tonight will help us figure out a way to fix it ahead of the race. Despite these challenges, I am still optimistic we can have a good race and fight our way into the points." Fernando Alonso: "This afternoon was a pity, because it’s been a good weekend for the team so far: we’d made some useful performance steps, and had regularly been in the top 10 in the sessions, so the problems we had in qualifying were extremely unfortunate. Jenson had a problem in Q1, and then my car just switched itself off in Q2. Unfortunately, we’re not allowed to continue in qualifying if the car doesn’t make it back to the pits under its own power, so that was that. Qualifying wasn’t the right time to have these problems, but hopefully we can learn from them for the future." 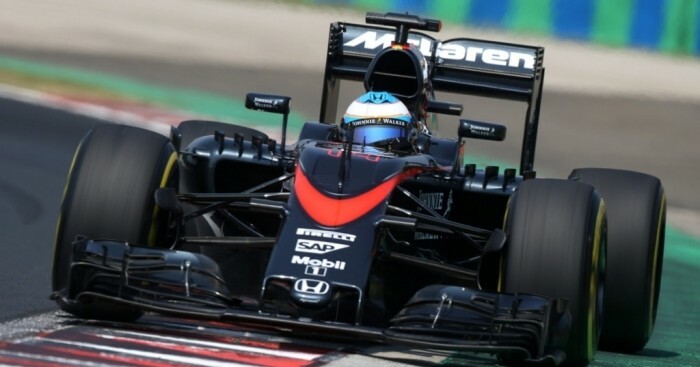 Jenson Button: "I didn’t get any electrical deployment down the main straight as I started my final lap in Q1. The engineers tell me that’s worth about four-tenths – and that just isn’t possible to make up around the rest of the lap. It was unlucky, but it is what it is. It was a shame too, because I really enjoyed driving the car today. The morning session was a bit tough, but the car immediately felt good this afternoon. The balance was good and we thought we’d easily get through into Q2. We’re not quick enough yet, but at least we have a good balance. Let’s hope tomorrow is a better day. I love driving around this place – it’s a great old circuit – and we’ll have a close look at what hand we can play tomorrow. But, even so, it’ll be a tough race, because you can’t overtake around here." Marcus Ericsson: "It has been a difficult weekend for us. We have done a decent job over the practice sessions, working step by step and trying to improve the car considering the package we have at the moment. Of course, it is disappointing being out after Q1. Now we need to focus on a clean race tomorrow." Felipe Nasr: "It was a difficult qualifying today. We were struggling a lot with the tyres due to overheating. On the other hand, the balance of the car feels good, but we just have not enough grip on the tyre side to fight against our direct competitiors. It is going to be a tough race, but we need to take any opportunity that might come up." Roberto Merhi: "I had a good qualifying today, so I’m really happy with the way this week is going for me. Tomorrow will be a tough race, but with the weather looking like it might be cooler, I think we can improve a little more. It would be good to give the team a nice result tomorrow on a difficult day, and leave us with a positive feeling as we head into the break." Will Stevens: "The weekend has been pretty tough; the hot temperatures have hurt our balance a little and I’ve been struggling to get confidence in the car. Qualifying was okay. My first run didn’t really go according to plan, as I made a mistake through the quick turn out the back, so there was a lot of pressure for the second. I lost quite a bit of time compared to how the first run had been going up until the time I had to abort, so it wasn’t perfect but Roberto and I are still pretty close and we’ll see how things go tomorrow. The temperature is expected to be quite a bit cooler for the race, which should help us."